I recently walked the Camino from St. Jean Pied de Port to Sanitago de Compostela. I know other Subud members have done the same and following the Pollo Gathering in Spain many of us walked the last 10 kms and attended a service at the Cathedral where the priest was paid to read a scripted account of Subud. This was much touted in Subud World News and Maya had masterminded it and the event was held up as a shining example of Subud in the world with some substantial spiritual significance. My own "pilgrimage" was not a positive experience and I ended up doing it rather fast to get it over with (21 days). I am attaching what is meant to be an amusing account of it. I am not sure that this is the type of material that fits in your magazine but it is another point of view for consideration. I believe that to get the most out of the pilgrimage to Santiago de Compostela one must approach it as closely as possible to the manner in which the pilgrims of the Middle Ages did. That is to say in order to really benefit from the pilgrimage one needs to follow the example of our forefathers and try and keep as closely to this spirit as one can. This unfortunately I did not do but can definitely see the merit of it. For them the most important focus of the pilgrimage was to get to Santiago de Compostela in the most direct way (the Roman road) and the most comfortable manner that they could afford – carriage, horse or on foot if necessary. Google maps tells me that one can get from St. Jean Pied de Port to Santiago de Compostela in 8 hours 26 minutes and there is a comfortable Parador in Santiago de Compostela. One might even follow the “Camino de Santiago” autovia which I got to see a lot of from the dreadful gravel footpath that wove in and out of it. I, like thousands of other born again pilgrims, chose to stagger down a vague approximation of the original pilgrim route in great physical discomfort on foot kept well grounded by an overloaded rucksack. 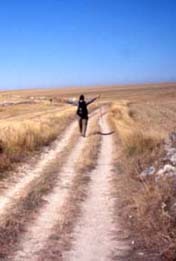 So what is the attraction and why do so many Camino writers claim that the experience has changed their lives? The only thing it changed for me was my feet. My personal conviction is that as the human race evolves it does so with a certain nostalgia for its former condition. There were a few wet sort of days on the camino including one where Noah would have felt quite at home but swimming it would not really be a reasonable option. Crawling or even loping on all fours would be even more uncomfortable than walking it and would certainly look very odd and take a very long time, but also one would probably get crushed to death by the hoards of eager walkers and bicyclists. For an understanding of normal evolutionary nostalgia one needs to look at more recent developments. In more recent times humans have evolved through Homo Erectus (standing and walking upright on two feet), to Homo Sapiens Sapiens (using one’s brain) to more recently Homo Sittingeasis (sitting around in the office or at home in front of the television, in bars or in fact just about anywhere). So by simply skipping any semblance of sapiens sapiens one can partake of a past life experience by tramping the 790 odd kilometers on foot standing vaguely upright. I appreciate that there may be some scientific flaws in this argument but it is the only rationale I can come up with for this exponentially growing surge in enthusiasm for what is, for the most part, a very dull walk. However in case my conclusions are not universally accepted let us consider some of the other possibilities. The one thing that everyone seems to agree upon is that it is accompanied by a large amount of physical discomfort. However if this is your reason for doing the walk then I seriously suggest that you consult a psychiatrist. I am therefore going to assume that this, along with uncomfortable lodgings, bad food, rain and mud, endless expanses of boring flat countryside, carbon monoxide from the steady flow of noisy traffic from the highways that one walks beside, stifling heat concentrating on the back of the neck and other plagues like blisters, tendonitis, painful ankles, stabbing pains in the shoulders and so on are all tolerated in pursuit of some deeper quest and are not the quest itself. One possible reason for the pilgrimage is Religious. The story of how apostle James got to be buried in Spain with his head attached would strain credulity one would think. Assuming that it is not a fib set loose by Protestants or Moors to discredit Catholics, it is said that he arrived in Spain by stone boat. I initially considered limiting my inquiry into the validity of the pilgrimage to studying the flotation qualities of stones off a beach in Finistere. But even if Saint James was buried under a church in Santiago de Compostela to justify a pilgrimage to his decaying bones one would need to assume that, contrary to the general belief that the soul is released from the body on death, in the case of Saint James it sort of got tethered to the bones. In fear of triggering another crusade it is not clear to me how God the omniscient and omnipresent is cleverly held captive by some strangely dressed gentlemen in a church in Santiago de Compostela. Nor can I understand how they can intercede on one’s behalf in persuading this captive God to expiate one’s sins (it is best to do this late in life anyway when one is either uninterested or incapable of most of the cardinal sins). I am bewildered by the strange ceremony in which these oddly dressed gentlemen get to swing an enormous incense burner over the heads of the congregation, historically as a form stench control but now a mediocre tourist attraction. Furthermore I do not see the connection between this and walking 100 or more kms. Are there rules other than the walking part in this devotion sport? Is one more likely to be absolved of sins if one is carrying a heavy backpack or one does the trip in competitive time? Does it matter how uncomfortably one spends one’s nights or how badly one eats during this period? In any event I speculate that the majority of participants in the camino olympics are not practicing Catholics and many may not even be Christian. Could the true meaning and life transforming experience lie, as some writers have suggested, in the comradery of the route. The true value therefore is through meeting with fellow pilgrims from all over the world. A deep inter connectedness is said to surmount the babble of tongues and meaningful human contact is made. It is possible that this deep human contact only occurs across the grunts and snores of comrades in dormitories of the albergues – which I cannot attest to as I strenuously avoided them. Of course if one has the disadvantage of English being one’s first and therefore probably only language then the camino cocktail party leaves one out a bit at the drinks tray as most people speak German, French or Spanish – not to mention Korean and Japanese. I may however have caught a brief insight into this spiritual connectedness by pure accident. At the end of a ridiculously long day I happened to be sleep walking on automatic pilot behind a middle aged lady from Paris talking to middle aged man from Brittany who was wearing full pilgrim look alike regalia including a fine pilgrim hat that blew off with each gust of wind. As it turns out I can sort of get by in French and understand it reasonably well (until they start telling jokes none of which seem to me to be at all funny). She spent at least half an hour without taking a breath complaining about her husband who was apparently deficient in every known way. However one probably does not have to go on a pilgrimage to discover that. I suspect that every married woman shares with every other married woman the total inadequacies of husbands, as a race, and their failure to do anything right. There must be an even deeper sharing that somehow escaped me. So is it the walk that is the attraction? There is no denying that, other than gross overcrowding, some of the stretches are attractive, assuming that it is not raining or oppressively hot. This is so notwithstanding the fact that much of the way is on road, whether tarmac or gravel, and nearly all the rest is on a special trail built to have a surface similar to a mini gravel road. But most of the trail weaves in and out of and within earshot of major highways. Some awful stretches actually run along the side of them and for long distances. Then also one has the endless stretches of dead flat, dead straight, dead landscape where the charms of nature are difficult to appreciate. There are so many excellent long distance hiking trails in the world this seems an awfully poor choice for a hiking trip. Not to mention the life threatening descent of packs of cyclists all dressed in spandex uniforms vaguely modeled on Star Trek. These spandex spectacles come in all shapes and sizes some with vast expanses of spandex holding up gigantic bellies from getting caught in the spokes. Enormous men with enormous spandex covered bottoms blotting out sun and moon – or perhaps just moon – come tearing down hill at one with no visible control over their machine, terrorizing walkers. From them “Buen Camino” means “Move over or die” or more literally “Buen” meaning “Get out of” and “Camino” meaning “The Way”. Well there is obviously something appealing to a lot of people to spend sometimes months on end following yellow arrows through towns and villages and industrial suburbs and across countryside. No doubt there are as many reasons for doing this as there are people. For some it may be a convenient form of escapism from even harsher realities at home – lost jobs, broken relationships, isolation and so on. For others it might be a personal challenge to see if they are capable of walking in a sustained way week after week. I dare not suggest that fashion or competitive one upmanship plays any part in encouraging this endurance sport. Whatever the reason for making this pilgrimage it is hard to understand the connection between walking for weeks and spiritual sustenance. Meaningful human relationships are more likely to occur between people speaking roughly similar languages. There are much more attractive and enjoyable long distance walking trails if the motivation is exercise. So what of the trail itself? Well this may be some of the attraction. A whole industry of camino tourism has developed around the mass of humanity tramping through formerly dying villages and backwater provincial towns. Albergue owners compete vigorously with each other to attract pilgrims to stay in their establishments. It must be a pretty profitable line of business because pilgrims are packed into dormitories cheek and jowl in rows of double bunk beds, with no overheads such as sheets, blankets, towels or toiletry and some access to mediocre and often inadequate toilet facilities at six to ten Euros a head. Then additional money is made from providing uninteresting and basic “pilgrim menus” and bar food, drinks and so on at inflated prices to an audience that is not inclined to move too far having walked themselves out during the daytime. Restaurants and cafes have sprung up along the way to cater to exhaustion breaks. Local shops have started to sell backpack sized packages of food and to open at unfashionable hours such as siesta time to capture passing backpackers. Nice little casas rurales and hostales have sprung up to cater for those for whom collective snore fests are not their idea of meaningful communications. And of course the camino trappings such as unwieldy wooden staffs and shells can be bought along the way if one inadvertently arrived under dressed. In spite of the challenges of routing this many walkers as close to the original pilgrim way as the highway system will allow the route does manage to take in some pleasant countryside. The official markings are clear and normally, atypical in Spain, placed at decision points. Much money has in fact been spent diverting walkers over and under dangerous highways rather than sending them into the arena to joust with trucks. Although I do not happen to enjoy walking on flat gravel road like surfaces it does provide a safe surface for walkers who are not using hiking boots. With some notable exceptions it is possible to follow yellow arrow way markers without even carrying a map. There however is an awful lot of vandalism on the route. In addition to graffiti and personal messages over all writable surfaces, there is some obscure repeating “joke” the humour of which is hard to understand that involves trying to erase, bend or add yellow arrows to point walkers in the wrong direction. Often it is clear what the route is but at other times it can be quite misleading. Also in commercial centers many of the merchants use yellow arrows to try and divert walkers to or past their establishments, which can lead to serious confusion. Finally there are on occasion alternative routes both of which are marked with yellow arrows so a map is necessary to pick the one that best suits one’s preferences. In general though the markings are good and clear and the route makes the best of the terrain across which it passes. Finally, why did I go on this pilgrimage. I had no very clear idea when I left and I have no very clear idea now that I am back. What I can say now that I am back, is that it was not a positive experience on any level although there were enjoyable moments. For me it is definitely, so to speak, a once in a lifetime experience. I did not enjoy pounding away day in day out along roads and well manicured paths in a constant trail of other pilgrims, burdened down with a heavy back pack. I got no enlightenment or insights that I could not have got from my armchair at home. I met a lot of very nice and interesting people who I talked to briefly, but the connection was not profound and the conversation was often mundane. Above all it was a lot of discomfort for no tangible benefit.